For some, the Mini Clubman wagon could be the most appropriate new Mini on sale right now. Though it may lack the aesthetic cohesion of the hatchback or the mass consumer appeal of the Countryman crossover, it is a vehicle that meets those two cars in the middle by being a more practical version of the five-door hatch. In fact, the only drawback for the Clubman that we could think of was that it wasn't available in John Cooper Works spec. That is, until now. 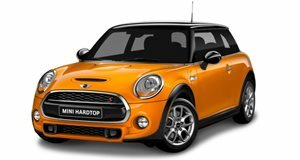 Though we concede that bemoaning the prior lack of a Clubman JCW is a pretty inconsequential niggle to highlight in the grand scheme of things, this new move by Mini does mean this should be the first and last time we complain about not having access to a bigger Mini John Cooper Works model. Especially as the overall package seems rather enticing: courtesy of the 228-hp turbocharged four-cylinde engine and Mini's ALL4 all-wheel drive system, this flagship Clubman can rocket to 60 mph from a standstill in six seconds, and the revised braking, suspension and aerodynamics should ensure its cornering pace and braking performance will also be on par with the JCW's straight line speed. Mini's yet to officially state additional features of the car, but we'd be surprised if the 17.5 cubic foot capacity of the trunk was impacted in any way. All of this will likely come at a price, though: with the Clubman ALL4 Cooper S starting at roughly $25,000, and being five grand pricier than their Cooper S equivalents, it's likely the flagship Clubman will rock up to its launch in December 2016 with a price tag close to $30,000. As a result, the Clubman JCW will likely be in a similar MSRP category to the equally practical Volkswagen Golf R and a decently-specified Ford Focus ST. We'll let you decide whether the Clubman's overall package is potentially worth that much money.